Since 2007 I have been working in the psychiatric rehabilitation clinic of St. Radegund, near Graz. The idea of psychiatric rehabilitation originally comes from Germany and its aim is – under the headline of “rehab over pension” – to keep as many people as possible who suffer from psychiatric conditions working. Basically, the idea should fund itself via all the pensions saved. Recently one of the insurance companies which funds my clinic has been thinking about how to facilitate more successful treatment of the patients in order to reduce costs. According to this the therapy itself shall be preceded by a so-called “assessment week”. Basically, the patients should be subjected to a “selection”. The aim should be to determine which patients are badly motivated and will not be able to regain employment and which ones are highly likely to regain employment and reach the goal of the rehab. The first group, those less likely to be rehabilitated, should be eliminated – at least so as not to continue being treated by this sponsor’s clinics. I was upset and felt horrible. In my fantasy I became a tool in implementing a normative idea that intends to further turn people into factors of production. Still, I decided not to run away. But, I asked myself, where is the limit of what I am willing to support? Since I am trying to be an analyst, I talked about it in one of my regular supervisions with an analyst of the New Lacanian School. For me, this international psychoanalytic institution constitutes a place where psychoanalytic discourse with a clear clinical orientation is possible. At first, I decided not to oppose this new programme in principle but to try to accept the signifier “assessment”. I was also willing to help in the working group to create something under this signifier that would seem more justifiable to me. And something has been accomplished: The signifier “assessment” has turned into an “orientation phase”. And there seems to be a process of change at work, that is ongoing, and which could eventually result in “selection and elimination” of patients changing in such a way that the doctors and therapists of our clinic could in the future have the chance to decide whether or not to accept patients. This has not been the case so far, since appointed patients had to be admitted. I think I can say that without my colleagues at the New Lacanian Field Austria – Vienna Initiative (it is only they who make a psychoanalytic discourse for me in Austria possible) and without the New Lacanian School with its precise ethic, it would not be possible for me to work in this clinic or to participate in the attempt, which I have described here, to contribute to the politics of health. I think I would probably have just run away with a feeling of moral superiority. But now I hope that, with my help, what I formerly felt to be so dramatic will be transformed a little. For me, by struggling to find my place as an analyst within a discourse of segregation and through talking to psychoanalysts outside the institution, from other countries – that is, ‘outside’ or on the ‘other’ side of this segregating master discourse – I have managed to create more places in which I can come to operate as an analyst within this institution. What would happen if I now lost my place? What would prevent me from taking up any old place? It is only via this discourse on the ‘other’ side, on the ‘outside’ that I can avoid losing my place. This is my testimony. After having spent many years believing that I could avoid it, I have gone to the ‘other’ side. This sentence – the title of a forum on racism to be held in Vienna on 6 April – means that the idea of belonging to something or of being at one with oneself has been revealed as deceit and illusion by psychoanalysis. There are many kinds of antipathy towards what is strange. This is because it represents exactly the part within us that we do not want to acknowledge, i.e., this is where the root of racism is situated. Every one of us has their personal exile. This is a fundamental truth of psychoanalysis, because in a certain way we are all strangers to ourselves. The Freudian term unconscious suggests that what is most intimate within each of us is at the same time not accepted and not known – and therefore denied. It could be said that the innermost, most intimate thing within each of us lives in exile. For example, we often believe that we are fond of someone because they are so great. But the truth is that we love them for other reasons – it can be simply the shape of the tip of their nose. Mostly we don’t have a clue why we fall in love and generally the reasons why are also much less than ideal. For example, someone wanting praise and attention in the end always picks someone who puts them down. We therefore have good reason not to want to know about it. In psychoanalysis we try to put someone in touch with what is most intimate to them, with what they desire and actually deny and from which they suffer. To us, the strange is the place where we try to find the most intimate part of ourselves. 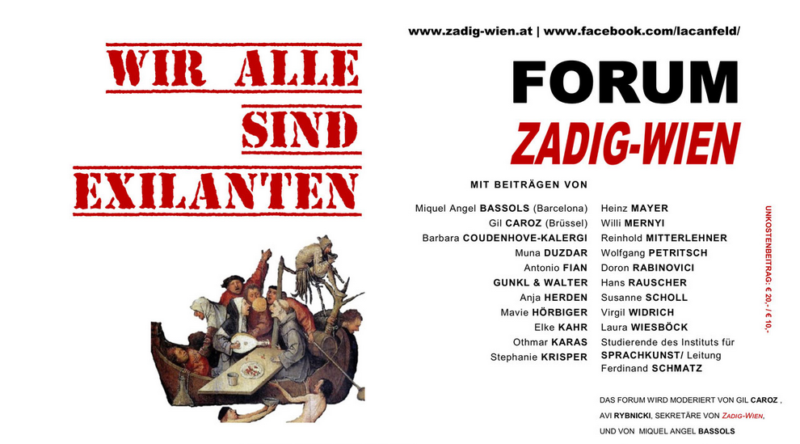 On 6 April Zadig-Wien will host an event at the University for Applied Arts in Vienna at 6pm, where we will try to show that every one of us has racist tendencies. The question is how we deal with it.